This makes for an unusual review, because it isn't of a theatre work. Except it is. Yet, it isn't. Kinda. Sorta. 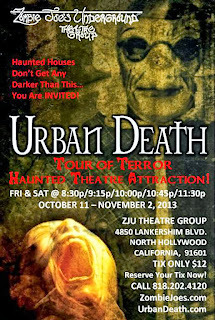 Urban Death Tour of Terror is Zombie Joe's effort into running a Haunted House for the Halloween season. Honestly, I was a tad puzzled about what to expect, but looking forward to it! Scheduled myself for "opening night" but the second show. Initially just wanted to show up a tad later, but I got the added fun of seeing folks emerging from the first--looking thrillingly scared! Now, really, giving away spoilers of a Haunted House would be just plain MEAN. So I'm not going to do that. But--I will make some comments and give some advice. Seem fair? First and foremost--the signs say this is not a show for children. Believe it! While some kids might have zero problem with the content, many parents would almost certainly not choose to expose children (i.e. those under 13 or so) to this material. Many would not want anyone in their mid-teens so exposed (although I don't think I'd be that squeamish, but...that is me). The folks at ZJU took the time to post such a warning. Pay attention! Second, don't go alone. If you're the sort to scream and jump, you'll feel better with a companion. If, like myself, you aren't that type you'll enjoy it more with someone who is! Mind you, I think that counts as excellent advice for any haunted house! Having said that, let me tell you this makes for a nice and creepy entertainment perfectly in line with the season and holiday! Frankly too many Haunted Houses (at least the one's I've been to) pretty much count on the audience/visitors knowing what will happen. More or less. They build on the anticipation of what everyone expects, then fulfills that expectation, hopefully with energy and a bit of style. Not this one! UBTOT in fact does the exact opposite! And kudos to them for that! In essence what they've done is turn the lobby into a maze. Hardly a long one, but you make your way through images that genuinely disturb as well as frighten. Really feels like entering some Bad Place, like the Overlook Hotel at full throttle or some building in the town of Silent Hill. We end up in the main theatre, where the victims...er, patrons...gather until a show begins. Not a long show. But at times a very skin-crawling one. I'm not a person who revels in horror or terror. When entering events like this I usually slip into a "detached" mode. It allows me to enjoy without getting freaked out. But here there were moments when I could feel my blood pressure rise and my breath quicken, then stop for tense moments. Even now, my imagination wanders back to some of the images and events of that night--and I shudder. Just a little. Then, we go back through the maze to exit--and the maze has changed! It now has somewhat different denizens and events we have not seen before! Again, no details. That would be wrong. But I certainly saw some people pretty much RUN out! So this haunted house has my recommendation! Urban Death Tour of Terror runs Friday and Saturday nights at 8:30pm, 9:15pm, 10pm, 10:45pm and 11:30pm through Saturday November 2, 2013. 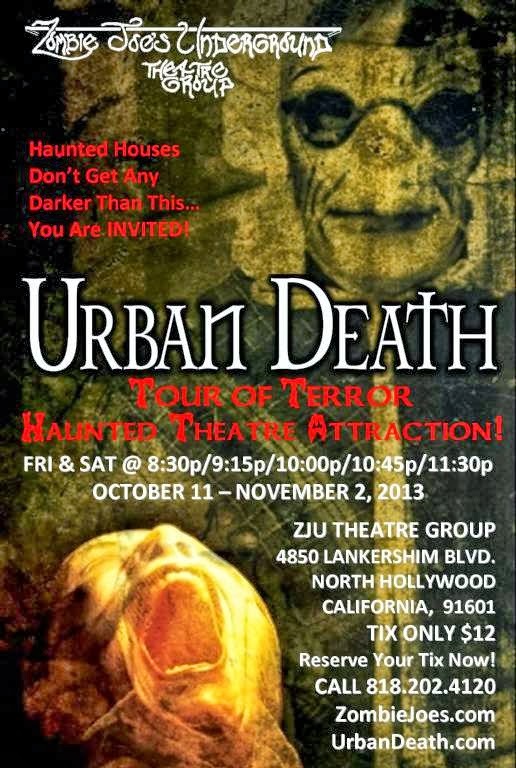 You can see it yourself at Zombie Joe's Underground Theatre at 4850 Lankershim, North Hollywood CA 91601. Just across the street from KFC and just south of the NoHo sign! H.P. Lovecraft casts a long shadow in the literature of the fantastic. Perhaps because his style, like that of many writers Lovecraft admired (Dunsany, Machen, Poe, etc. ), tends towards the very literary than the dramatic, few adaptations get all that much renown. Dracula and Frankenstein remain straightforward stories after all. Even The Turn of the Screw has at least an obvious plot. Not so much The Call of Cthulhu. Doesn't keep folks from trying though. Case in point--The Visceral Company's latest effort Lovecraft: Nightmare Suite. 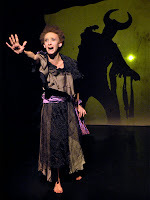 This show doesn't try and tell one story, but rather present several, in a manner perhaps best described as dreamlike. In the process we experience many tales that don't lend themselves to long versions or plot-driven films. And we also see many theatrical tricks that help us enter into the world of the show, up to and including puppets and shadow theatre. Eric Sand begins, quoting Lovecraft on the subject of (appropriately) of fear. Afterwards we enter into The Testament of Randolph Carter (Carter many agree is a kind of surrogate for Lovecraft himself, a recurring character in several tales). Mr. Carter has to tell someone--presumably the police--again and again of what happened the night his friend vanished. Next The Cats of Ulthar, narrated by the lovely Devereau Chumrau explaining precisely why it is in the far-off city of Ulthar they have made it a crime to kill any cat. As it happens that story uses quite a bit of said stage tricks. Music accompanies Chumrau's narration, while puppets of the various characters make their way on stage. Later, shadows do their part. already knew the climax, yet still shuddered at is revelation, gives some idea of the power at work in this production. The Picture in the House was the only Lovecraft work here I didn't recognize, and functions more as a straightforward thriller than the others. Steve Peterson in particular did a fantastic job capturing a character both bizarre yet strangely real (also, the Maine accent is very tricky to get right, and he nailed it). Despite my warning above, the actual crux of the horror in this story shall remain untold my yours truly. Next Cool Air as told/performed by Nicole Fabbri, another shifting of gender that works quite well. This one in fact was once done as an episode of The Night Gallery years and years and years ago. But in the hands of the Visceral Company the result captures far more the weird and brooding atmosphere of Lovecraft. 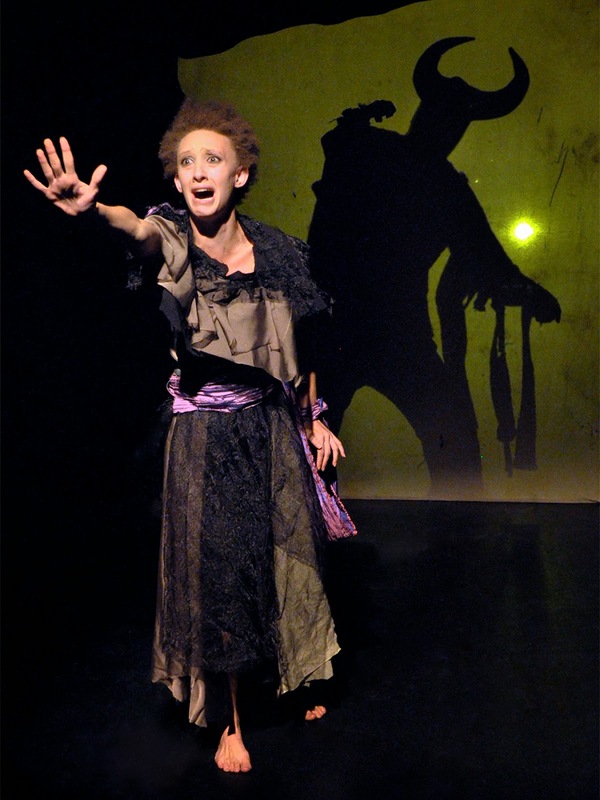 This has Fabbri interacting with shadows, as well as other cast members. shadows might seem to move. Machines feel more mysterious and the echo of the past seems louder. Somehow we feel these people have not traveled as much as we ourselves. And by some strange psychological alchemy, they are more prone to notice the horrible Other while less able to accept such notice without trauma. The result is eighty minutes of shadows we increasingly realize are anything but empty. Not only the actors I've mentioned but Andrew Bourgeois, Daniel Jimenez and Mark Souza all help create the overall feeling of fascinating dread. Which is not to say some moments don't falter. One vocal recording doesn't really work, at least not for me. The recording of Fungi from Yuggoth barely accomplished what it seemed to be aiming for. For that matter I'd have to say the play stopped rather than coming to an end. But these remain nitpicks, and take nothing away from all the elements that did do exactly as they should have. Case in point--I saw this show on a Sunday matinee. When emerging into the lobby with its open door, the streaming sunlight outdoors felt unnatural for a few moments, as if I'd just spend almost an hour and a half where sunlight could not belong. Which, in a way, I had. Lovecraft: Nightmare Suite plays Fridays and Saturdays at 8pm, Sundays at 3pm until November 3, 2013 at The Lex 6760 Lexington Ave, Los Angeles, California 90038. Some people like writing negative reviews. Friends have even said to me "But they can be so much fun!" I disagree. Celebration rather than criticism gives me a lot more pleasure. 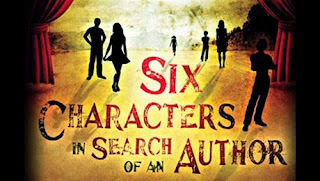 Which makes it sound as if I'm going to slam Six Characters in Search of an Author something fierce. Actually, no. I'm not. But express my frustration? Note what I think doesn't work? Yes. To begin, I'm fairly familiar with this play, having seen several productions (albeit none for over a decade) and even having played a small part in it once (and poorly--that bit of awareness has grown over the years). It makes for a very difficult show to put on. The language hardly resembles natural speech at all, at least much of the time, a fact totally in keeping with the subject matter. The Father (Roger K. Weiss) especially is a man given to thinking in abstract and extremely individual terms. Which makes sense. In a real sense he and the other five of the title aren't actually people. They remain now and forever characters in an unfinished play--who've somehow interrupted a rehearsal to demand their story be told. A weird idea to wrap one's head around. It also contains within it some traps. But first, let me address a few points. I've seen a few of the people in this cast before now. Weiss for example, as well as Katie Lynn Mapel who plays The Mother (one of the six characters). Frankly, I think the rest of the cast also shows genuine talent. Yet there are several problems. First and foremost, several cast members are too young for their parts. As a result, they cannot help but lack some of the gravitas the roles demand, especially The Mother (Mapel is in her twenties). It feels a bit college-level as a result. How can it not? But to be sure, this is to some extent the luck of the draw. Frankly, I found more problems with the direction. I hesitate to say this because I met the director afterwards and thought him splendid company. But three problems in this production must squarely belong at his feet. One is simply the blocking. I'm not a fan of actors "wandering" on stage, of which I saw a fair amount. Perhaps that is taste, however. More tellingly, sometimes the blocking contradicted the lines! In the second act there's a black sofa in the center of the stage but the Director (Kari Cowell) then tells the Stage Hand (Robb Conner) to go "get" the black sofa. About the same time The Stepdaughter (Maria Leicy) demands a screen, then later refers to it--despite the fact There Is No Screen On Stage. There's also a stage fight for a bit in the second act that is clearly under-rehearsed. More understandable, at least to my mind, is a decision made with great consistency throughout, which leads me to believe the director was behind it. Given that Pirandello's work is so often (understandably) listed as "Theatre of the Absurd" it makes sense. At least one can understand why someone might make this choice. But to have the actors and director interrupted by the Six Characters of the title turn out to be...well, bad...does not in my opinion serve the piece. Quite the opposite. Indeed, I must give kudos especially to Nora Reilly who played The Leading Lady and Markus Cummings as The Leading Man for creating actors I believed were bad. Had they themselves simply been bad actors, I would've been pulled out of the story. But I wasn't! So I know these two can act--because they successfully made me believe their characters could not! But this whole choice gets in the way of the author's ideas. We're left with the feeling that if the Six were to find good actors, then their dilemna would be solved. But isn't the whole point that it wouldn't be? The Six exist in a strange way distinct from what any actor can convey, no matter how talented and sincere. Hence the tension, between imagination and execution. Eugene O'Neill for example famously once claimed exactly one actor had ever done a single one of his characters justice. Paul Robeson he said was adequate as The Emperor Jones. Adequate. Nothing more. Yet let us also admit, the choice itself serves to at least help make one think about these issues. So while objectionable to me, it might serve a useful purpose to another. Finally, though, I'm going to be very critical about technique. Having been trained very thoroughly myself this is a matter that irritates me quite a lot. True, very many Americans tend to drop their last consonants, especially the plosives (t and d most of all) but actors should not. Period. Likewise I saw in this production what seems nearly endemic in many Shakespeare productions when faced with long or simply heightened speech. Instead of talking, some of the actors when faced with these grabbed onto an emotion for dear life and then spewed out their lines. To be fair, I've seen that done by major movie stars in big budget productions. Didn't like it then, either. And when actors haven't had the good fortune to find coaches giving them that kind of technique, it is the director's responsibility to help them along. Given that I've seen two of these actors deliver good performances in other venues--one in verse--I place this responsibility on the director. But let us not ignore the positive! For a brief few seconds in the first act, I did a mental take on the racial makeup of the family which makes up the Six. Yet after those few seconds it seemed perfectly ordinary. Too often non-traditional casting trips up in some way on self-consciousness. No so here! It worked very well. Likewise Carla Valentine gave a near-perfect performance in the small but very memorable role of Madame Pace. Of the Six the Little Boy (Norton Leufven) and Little Girl (Sara Vasquez) both carried off what they needed to very well indeed. Children can get bored easily. It takes some extraordinary focus for child actors that age to do well while on stage so long. And make no mistake--I've seen theatrical productions where I squirmed in my seat, forcing myself to keep watching. Critical of this show I may be, but I cannot call it "bad." Indeed, despite the genuine problems throughout the cast conveyed the real power of Pirandello's most famous work. For that alone I'd recommend the show. Not without reservations, but I would recommend it. 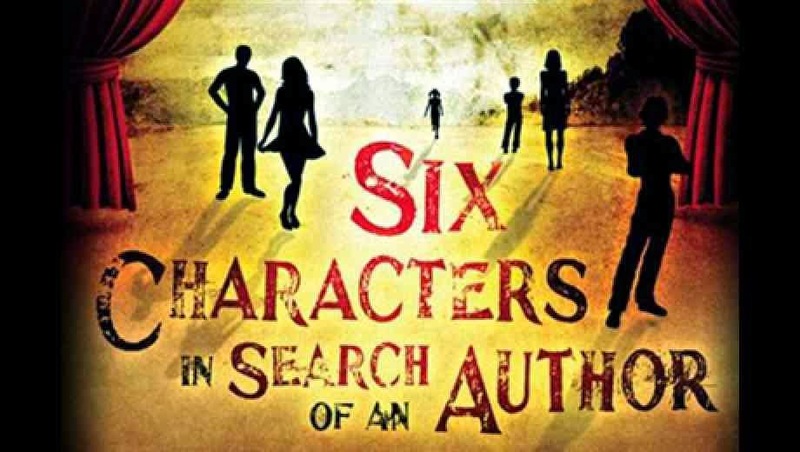 Six Characters in Search of an Author by Luigi Pirandello plays Fridays and Saturdays at 8pm, Sundays at 3pm until October 27 at J.E.T. Studios 5126 Lankershim Blvd., North Hollywood, CA 91601. You can make reservations here or by calling (323) 239-0485. For those who don't know, Jalal Ad-Din Muhammad Rumi was a poet (among many other things) eight centuries ago--a time when the civilized Middle East was under attack by the mostly-barbarian West. Europe had begun to take steps that would result in the Renaissance, while Islam was no longer united. Despite a literate and sophisticated culture, it faced increasing political turmoil. But this great man of that age, over time became not only remembered in his own culture, but throughout the globe. He ranks with Shakespeare and Ovid among world writers. The play Rumination emerges from the impact this man's words have on those who read them today. Nine performers and director Amir Khalighi don't create so much a play as an experience, very nearly a dance performance with words. Doesn't hurt the cast is made up almost entirely of beautiful women. Just saying. Anyone who saw ZJU's The Raven earlier this year has some idea of what staging a collection of poems can turn out to be. Rumi, unlike Poe, is not Gothic. He seeks not to invoke or explore horror and fear. He too understands melancholy but chooses to sail upon its surface rather than dive into the depths. 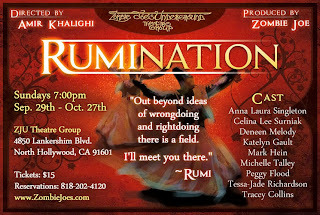 Rumi has somewhere else to go. The set helps create the atmosphere, with oriental rugs and pillows below a pair of lovely Middle Eastern lamps. It feels like somewhere of another time, a different era. More, we soon realize what kind of emotional place we've entered. Imagine if you will a campfire. Or maybe an exotic beautiful place, visited at a special time by a group ready to be changed. Like friends at a fire on the beach late at night. Or visiting a garden, the favorite place of a beloved on the anniversary of their passing. We watch and listen as they talk in the words of the Poet, taste the memories of what they have known and are feeling now. "Not Christian or Jew or Muslim"says the poet, at least in through the voice of an actor (in this case Mark Hein) "Not Hindu, Buddhist, Sufi or Zen." Sets the tone nicely. Although written in the 13th century, these gifts of words are for life in all times. What follows are over dozen poems, spoken and acted, recited and sometimes danced. The company of Anna Laura Singleton, Celina Lee Surniak, Deneen Melody, Katelyn Gault, Michelle Talley, Peggy Flood, Tessa-Jade Richardson and Tracey Collins work together very well as an ensemble. No small thing--nor the kind of synergy that happens by accident, at least not often. Clearly everyone worked to create this palpable air of contemplation, honesty and, in the end, celebration. 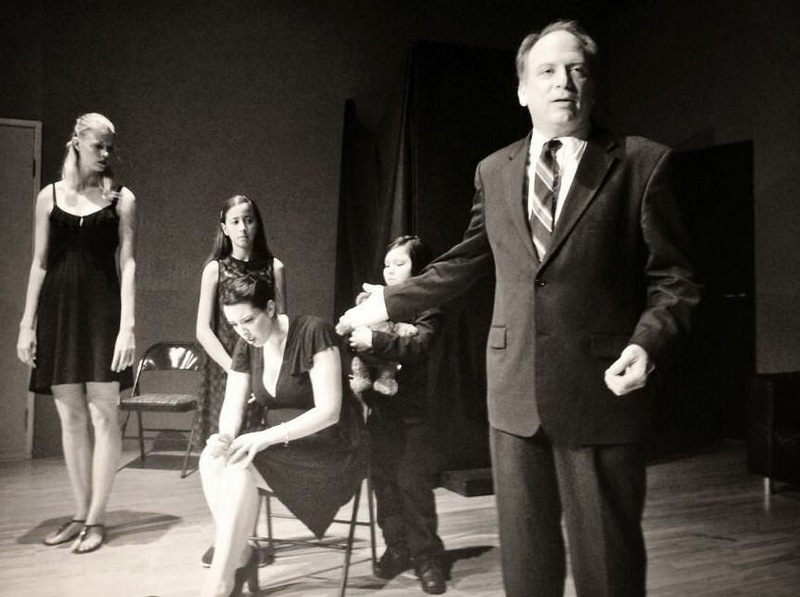 Zombie Joe's theatre usually tends toward the grand guignol rather than the contemplative, but we shouldn't forget this company has also done works by Doesdievsky, by Shakespeare and Oscar Wilde. Even an award-winning Hamlet! But one cannot have shadow without light. Rumination makes for a cleaning of the theatrical palate. Fresh water, perhaps with lemon, to wash away the taste of bourbon or absinthe. It moves as well as entertains. That is about as high a praise as any theatrical performance can receive! 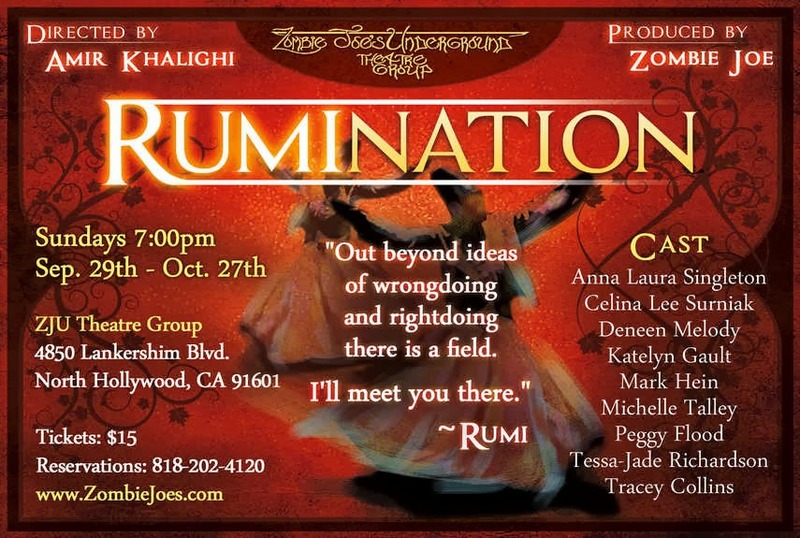 Rumination runs Sundays at 7pm until October 27, 2013 at Zombie Joe's Underground Theatre Group, 4850 Laknkershim Blvd. North Hollywood (across from KFC). You can make reservations at 818-202-4120.